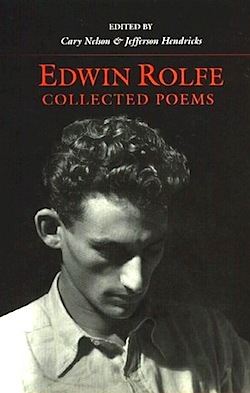 Jacket 40 - Late 2010 - «Collected Poems of Edwin Rolfe», Cary Nelson and Jefferson Hendricks, Eds., reviewed by Tom Hibbard. It is copyright © Tom Hibbard and Jacket magazine 2010. See our [»»] Copyright notice. University of Illinois Press 1993 Urbana/Chicago 337pp. In the late summer of that year we lived in a house in a village that looked across the river and the plain to the mountains. In the bed of the river there were pebbles and boulders, dry and white in the sun, and the water was clear and swiftly moving and blue in the channels. Troops went by the house and down the road and the dust they raised powdered the leaves of the trees. The trunks of the trees too were dusty and the leaves fell early that year and we saw the troops marching along the road and the dust rising and leaves, stirred in the breeze, falling and the soldiers marching and afterward the road bare and white except for the leaves. I was always embarrassed by the words sacred, glorious, and sacrifice and the expression in vain. We had heard them, sometimes standing in the rain almost out of earshot… and had read them on proclamations… now for a long time, and I had seen nothing sacred, and the things that were glorious had no glory and the sacrifices were like the stockyards at Chicago if nothing was done with the meat except to bury it… .Abstract words such as glory, honor, courage, or hallow were obscene beside the concrete names of villages, the numbers of roads, the names of rivers, the numbers of regiments and the dates. Deep inside some sort of political feelings must have stirred Hemingway to go to Europe and join the ambulance corps during wartime. Moreover, other American writers also were drawn to the tumult in Europe. Cowley was a driver in the war, as were Dos Passos, Julien Green, E.E. Cummings, Slater Brown, Louis Bromfield, Dashiell Hammett and others. If Hemingway was apolitical perhaps it was because Europe and the United States were saturated with a superficial sort of political bickering. The Russian Revolution in 1917 created an atmosphere of revolution and radicalism. Like Hemingway, other Modernists were not aligned strictly politically. Ezra Pound’s loss of personal friends in World War I pushed him toward pacificism. Perhaps American expatriates were able to view the political activities of countries on a foreign continent as currents in the immense vortex of world-wide transformation. The Modernists, including and perhaps especially Irishman James Joyce, were bent on radical aesthetic ideas. Pound’s Cantos are Cubist precursors of all forms of abstract and multi-media creations, economic and ecological models and diagrammatic representations as are some forms of today’s visual poetry. Like science, Modernist art and writing hoped to plummet the ineffable depths of matter and creation before the viewers’ eyes in the laboratories of canvas, sculpture and text. Paris in the twenties was not about politics but the problems of existence in a disembodied world. In the U.S., politics was more the milieu of ideas. Due to lingering economic issues from the excesses of the Gilded Age, the rise of labor, immigration, racial injustice, the challenges that the early 20th-century wave of Communism posed for Democracy; a phalanx of Leftist writers pressed for the recognition of new perspectives toward the poor, the working classes, women and society in general. It wasn’t long after returning from Paris that Malcolm Cowley found his literary magazine “Broom” suppressed in New York by the U.S. Post Office (1923). There were many radicals in the U.S. who did not share Hemingway’s scruples about being political. There was a thirst for anarchy and revolution. Activist journalist Mike Gold had already published “Toward a Proletarian Art” in “The Liberator,” which he edited, in 1921. Kenneth Fearing published many poems in the twenties in “The New Masses.” When the stock market crashed in 1929, beginning the decade of the Great Depression, the flood gates were officially opened for politically influenced poetry collections, plays, films, novels (such as Robert Cantwell’s Land of Plenty, 1934; Horace McCoy’s They Shoot Horses Don’t They, 1935; Jack Conroy’s The Disinherited and James M. Cain’s The Postman Always Rings Twice, 1934) irrigating the great land of Roosevelt’s New Deal. The class struggle carried conditions of immediacy and of direct and exact references — and for that reason there can be little doubt, the proletarian movement was exciting, even to that majority of writers who shared in no ideology. In troubled economic times, need wears through. The deprivation of the Thirties brought with it a liberating disorientation, a piercing longing for and envisioning of “imaginative reality” and even a “critical reality” above “natural reality.” “Proletarian writing,” as it was somewhat euphemistically termed, became realism, a more intense realism, a grimmer perception of the uneven textures and overlooked contours of life due to unabated highs and lows. The way that political radicalism of the thirties and forties comes to us today is as a synonym for imagination, poetry, newness, even integrity and honesty. One of the writers that exemplifies this — and there are many — is Edwin Rolfe. Rolfe was born Solomon Fishman in Philadelphia in 1909, the son of Jewish Russian immigrants. The family moved to New York, where the father became a union official, a socialist and later joined a faction of the Communist party. Rolfe got his name from publications in which he used the pen name Edwin Rolfe. One of his early poems was “To a Subway Worker” published in the “Daily Worker.“ In 1929, Rolfe left New York and enrolled in the Experimental College at University of Wisconsin. He ran out of money after a year and a half and returned to New York. In the case of Rolfe, Hemingway seems to be precisely correct. In the broadest sense, Rolfe was essentially and primarily a fighter against fascism. It is the fermenting, like wine in a mountain wineskin, of the poems in Rolfe’s Spanish War collection, First Love, that makes it the exceptional collection that it is. Rolfe has taken his post-war experiences and worked them into his recounting of the war, creating a metaphor of deep-seated brutality, antagonism, illusion and effects of non-being. The writing is descriptive, painstakingly comprehensive, so that it cannot collapse into its own antipode. It is as much about the landscape of intimidation and McCarthyism as it is about the landscape of Spain. Each of the thirty-nine poems covering sixty-two pages (in Collected Poems) blocks out a different area of insensitivity, warns against a different form of trickery and betrayal, exposes an aspect of tyranny, attempts to maintain ties between human beings that are breaking apart and drifting toward a society of enemies. As is also generally the case with Kenneth Fearing’s poetry, Rolfe’s First Love is truthful beyond politics. It is a complex association of fact and idea, the particular and general, loyalty and adventure, commitment and detachment, work and idealism, empiricism and conceptualizing. Writes Rolfe editor Carey Nelson, “[Rolfe’s poetry] insists that the intense subjectivity of romantic love and the daunting generality of social struggle are connected.” And again: “[Rolfe’s poetry suggests] that the two discursive registers — lyricism and polemicism — are interdependent.” Above all, the lucidness of its portrayal cannot be missed. It is based on ecstatic experience rather than fitted to well-defined political aims. the silence, the unspoken word. what the word enemy means. In “Prophecy in Stone,” Rolfe again considers what the setting reveals. landscape I could not penetrate. I call your name endlessly, savor it like a lover. in your arms of tenderness and wounded granite. I too sometimes despair. I weep with your dead young poet. homes, wives, even memories, are lost. most cruelly impossible of all possible worlds. But why are my thoughts in another country? and the black-smocked girl approaching, her hands laden with grapes? The idea of first love is first and last love, a love that cannot be superseded, an understanding, emanating from the quirkiness of life, that is used as a measuring stick. Rolfe is saying that in his experiences in Spain he was able to get outside the restraints of custom and the insensitivity of stagnant society in general, to see beneath the surface, to feel in a way he did not feel before and in a way that he will never forget. First love is radicalism or activism itself, a more-than-conforming commitment, abstract ideas that are felt. He was able to think, to envision himself in the context of what was taking place and to renew his sense of himself as an important part of humanity as a whole. The basis of Rolfe”s First Love is that perception itself is radical, that poetry must find its basis in this sort of perception. Certainly, the emphasis on social concerns gave a heft and significance to their works often lacking in current fiction. The better writers of the thirties did have a social message to convey, and some of them did express it vividly and significantly. The political ideas enter in and are important, but (as perhaps Hemingway demonstrates) they are so all-encompassing, made more so I would guess by the opacities of war, and at the same time so clearly limited to a strictly human type of endeavor that they can be expressed only in an intense, fragmented, striking, wide-ranging, hypothetical language that reaches toward the only-partially-known. In dire times, American radical writers of the Depression turned to writing news-stand fiction. Kenneth Fearing for a while was a rich man when his 1946 mystery novel The Big Clock was made into a movie by Paramount several years later. Fearing received well over a quarter of a million dollars for the movie rights in current value (though he and his wife at the time quickly drank it all up, and Fearing died broke). Rolfe too tried his hand at the genre. Things looked bright for the Rolfes when Hollywood became interested in his co-written 1948 Bantam paperback Murder In The Glass Room and was ready to purchase the movie rights. However, in 1947 HUAC had begun conducting its well-known investigation of Communism in the film industry, and, though he was not one of the notorious “Hollywood 10,” Rolfe was essentially blacklisted in the industry. The movie was not produced, and Rolfe’s script work disappeared. It would seem that Rolfe’s blacklisting had at least one good effect. First Love, still today a little known work, was published in 1951. By accounts it was published by Larry Edmunds Book Shop in Los Angeles, and it was self-published by Rolfe. The collection, clearly highly reworked by Rolfe during the forties and perhaps early fifties and undoubtedly much influenced by the treacherous and high-voltage atmosphere created by the HUAC probe, would not have been what it is and might not have been finished at all if Rolfe had become a successful Hollywood script writer. Nor, perhaps, would Rolfe’s poems directly about the red-baiting McCarthy 1950s, published in 1955, a collection titled Permit Me Refuge (somewhat gratingly similar to James Agee’s Permit Me Voyage put together much earlier in the thirties), along with many uncollected poems of the same time, have been written. * Rolfe died in 1954 at age 45 of a heart attack (Agee died one year later also of a heart attack). It seems that what we want to say about Rolfe — and with him the radical writers of the Great Depression — is that he was an excellent poet, an inspiring person, an admirable person, with a hard-fought and abiding commitment to the future of mankind. Perhaps Langston Hughes’ poem written during the Spanish Civil War for Rolfe on his birthday while Hughes was a correspondent in Madrid might serve as an epitaph. * In the interest of fairness, accurate perspective, I feel moved to include the information that Rolfe’s blacklisting in Hollywood was not his first encounter with this sort of treatment. In 1934, Rolfe was fired from the Daily Worker because a fellow writer, a “comrad” deliberately lied about him. Editor Nelson talks about the incident in the introduction and notes that the poem “Definition,” in which the words “charlatan” and “false” are used to describe his accuser, was Rolfe’s response. Tom Hibbard has had several bio notes appear in Jacket. A fairly long one in particular is attached to his Jacques Derrida review and/ or long poem “Big Snow” in Jacket 37 (along with a photo). Since then reviews of Michael Rothenberg and William Allegrezza have appeared in issues 12 and 13 of Eileen Tabios’ Galatea Resurrects, and a review of Mark Young’s selected poems Pelican Dreaming appears in issue 14 of Big Bridge. Several new poems are online at Moria winter-spring 2009 and the final issue of Jack. Also Andy Gricivic’s Cannot Exist. Hibbard read his poetry at Myopic Books in Chicago in November of 2009. Most of these poems are from his unfinished collection The Sacred River of Consciousness.